LOOKING FOR SOMETHING SIMILAR? CHECK THESE OUT! You get to feel like a genuine citizen of this cool, lively city while enjoying the advantages of a hotel stay—luxury linens, parking, security, plus local concierges on call 24/7 for help finding restaurants, transportation, and tickets! The difference? Peace, privacy, space, and a location beyond the expected. This apartment is flooded with sunlight, with a main living area bordered by floor-to-ceiling windows. If the weather rules out patio life, the interior is chic and livable, with accents in cream, grey, and raspberry. The contemporary kitchen is complete with gleaming tiles, stainless steel appliances, an eat-in counter, and comfy couches for watching Netflix on the flat screen TV. The master bedroom is clean and serene, such a great retreat. The second room with a home office space has a secret—a drop down Murphy bed. Muted tones and natural materials give the bathrooms a spa-like serenity. Roma Norte is both hip and historic, a neighborhood rich with cafes, art galleries, and nightlife. Within biking and walking distance you’ll find the city’s major cultural attractions, including major museums and world-famous parques and plazas. 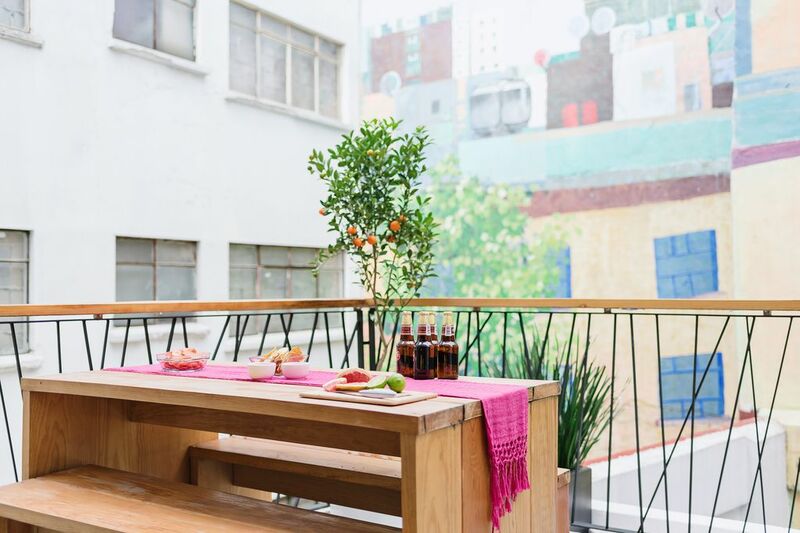 Experience thriving metropolitan Mexico City life in a handpicked home by Remixto. We are Remixto Metropolitan, the premiere vacation home specialist in the urban heart of Mexico. Our stylish, contemporary homes in the center of bustling city life are hand-selected for their unique character and ability to transport our guests to a truly local Mexico City experience. Very comfortable apartment in Roma Norte. The apartment was clean and well provisioned. We didn’t make use of the modern kitchen because there doesn’t seem to be a grocery store nearby. However, there are many restaurants in the area to chose from. The doormen are super friendly and nice. Extremely comfortable, well-appointed, light and airy, and well located. Fantastic apartment for folks who want to explore the city's many neighborhoods and have all the comforts of home. Very clean and well kept. A gem. This apartment is the perfect size for two couples. Had a great living area and patio and was in fantastic location. Very accessible. There is also a guard on duty 24 hours, which is a nice safety feature. Perfect retreat for our family of four. Loved it. Perfect location; well-appointed apartment. Unbeatable atmosphere on the patio. Roma Norte is both hip and historic, a neighborhood rich with cafes, art galleries, and nightlife. Within biking and walking distance you’ll find the city’s major cultural attractions, including world-class museums and renowned parques and plazas.